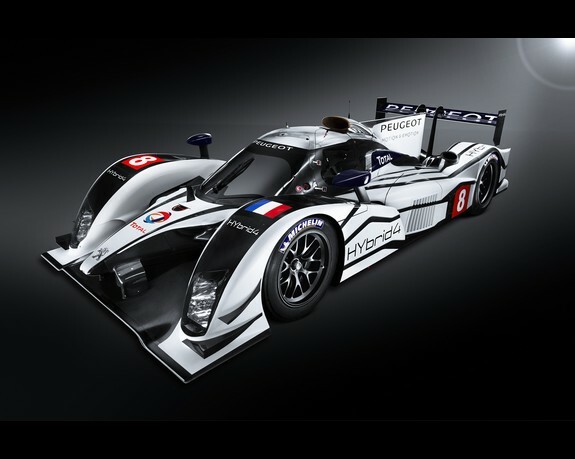 Peugeot is planning to test a diesel-hybrid version of its 908 sportscar ahead of the Le Mans 24 Hours this year. Although the French car maker opted for a diesel power unit for its latest challenger, it has announced that it is planning to run the hybrid version at the official pre-Le Mans 24 Hours test day at the French circuit on April 24. "Achieving this ambitious objective will depend on how well the team's preparations for Le Mans go with the new 908, and also on how the 908 HYbrid4 performs during its maiden track test at the end of March," Peugeot said in a statement. The system used by the 908 HYbrid4 recovers and stores the kinetic energy generated under braking and it provides a power boost of 60kW (80hp) during the seconds that follow its redelivery. The hybrid car will be on display at the Geneva Motor Show this week.